The Kia Stinger Fastback Sport is the latest new model to enter Kia's lineup. 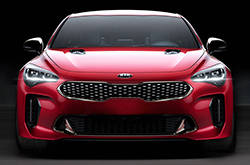 The five-passenger sedan is said to be the highest performing production car in Kia's history, and it's sure to cast a spell over shoppers in the market for a sports car. Offered in two trims, Stinger and Stinger GT, the fastback offers everything you could want and more in a performance sedan. Athletic and powerful are the best words to describe the 2018 Kia Stinger in Houston, Texas. It's sleek and muscular yet offers a hint of elegance that is pleasing to the eye. A tiger-nose grille sits proudly at the front of the Stinger, just below its long hood. The model also sports a smooth underbody, front air curtain, wheel arch gills and an integrated rear diffuser that supports its performance capabilities. Take a moment to learn more about the new fastback in our 2018 Kia Stinger review below. 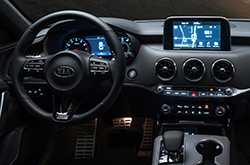 The interior of the Kia Stinger exudes luxury. Buyers can line the seats with Nappa leather and air-cell bladders that aim to deliver maximum comfort during long travels. A leather-wrapped steering wheel is also included within the cabin, as well as a split center console. Infotainment controls have been separated from the climate and ventilation controls, allowing drivers to easily access both sections. A satin chrome trim piece also encircles the cabin, delivering a sense of intimacy. A collection of top-of-the-line technologies are made readily available in the 2018 Kia Stinger in Houston. A Color Head-Up Display allows drivers to see specific driving information on the windshield, a wireless smartphone charging pad is offered for passengers and Bluetooth hands-free calling is standard. Additionally, there are three different speaker systems that can be had on the Stinger. The base audio system comes with six speakers and a 7-inch touchscreen, while the 3.3L twin-turbo model comes with nine speakers and an external amplifier. A Harmon/Kardon system is also available; it comes with 15 speakers and pumps out 720 watts through an external amplifier. 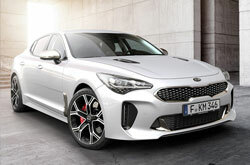 What Engines Can I Find in the 2018 Kia Stinger? A 255-horsepower 2.0L turbo four-cylinder, generating 260 lb.-ft. of torque, comes standard on the new Stinger. However, if you want a little more power, you can opt for the 3.3L twin-turbo V6 Lambda II powerplant. Producing 365 horsepower and 376 lb.-ft. of torque, the engine is said to go from 0 to 60 mph in 5.1 seconds. Both engines are matched to an eight-speed rear-drive automatic transmission. 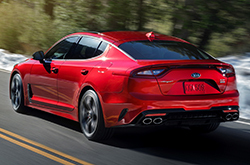 Mentioned in several 2018 Kia Stinger reviews, Forward Collision Assistance, Autonomous Emergency Braking, Lane Keep Assist, Advanced Smart Cruise Control and Rear Cross Traffic Alert are offered on the fastback sedan. To help combat drowsy driving, Kia has also outfitted the sedan with Driver Attention Alert, which warns the driver that it's time to take a break from driving if it senses the driver's attention level is reduced. Visit us at Joe Myers Kia today to check out these sophisticated features in person. Is the Kia Stinger Perfect for You? If you live in the Houston area and have been shopping around for a new car like the 2018 Acura TLX, Infiniti Q50, Volvo S60 and the Cadillac ATS, we recommend you take a quick look at the 2018 Kia Stinger. You may find that it is a fine match for you, with its eye-catching exterior styling and clever onboard technologies. 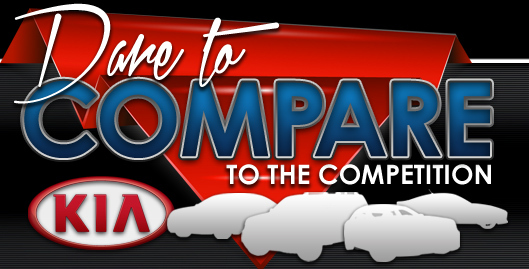 Take advantage of our review and try the comparison tool to see if the 2018 Kia Stinger is suited for you. Also view factory offers while you're here! As a neighborhood Kia Stinger dealer, we're the destination to find the latest financial incentives on both new and gently used car models. To help you make a sound decision when purchasing your next car, we've included this 2018 Kia Stinger review right here on our site, making it effortless to find the details you . You are certain be in awe when you visit Joe Myers Kia to test drive the Kia Stinger; we welcome you to come see the model for yourself. Before visiting, you can take a peek at its innovative features by checking out the enclosed video recording.